When it comes to selling estate jewelry, it’s crucial to know that your precious piece of jewelry is sold at a fair price. There are many estate jewelry buyers on the market, but not all of them are specifically specialized in assessing pre-owned items when selling jewelry. Luckily, with NYC Bullion, you can be sure you will receive the best assistance in the evaluation of your estate jewelry assets. Our mission is to ensure a completely transparent and highly reliable authentication process of each old jewelry item. For this reason, you can be sure you will receive a free, accurate appraisal if you decide to sell estate jewelry in our store. Simply visit us in the Diamond District, and we guarantee you will leave our store completely satisfied with our customer service experience and delighted by your generous cash payout. Where to Sell Estate Jewelry? Searching for where to sell estate jewelry? You won’t find a better place for selling old gold jewelry or any pre-owned precious metal or stone jewelry. Here, at NYC Bullion – we aim to deliver you the best customer experience when selling estate jewelry. Our gemologists and jewelry professionals with years of expertise will give you a qualified assessment of any estate jewelry items – from necklaces to earrings and rings. Forget about going to pawn shops and receiving unfair quotes or undervalued offerings. Once you enter our store in the Diamond District Area, NYC, you can be sure you will receive a high-quality appraisal and a superb cash for jewelry payout that you cannot pass up. How to Sell Estate Jewelry? Thinking about selling your estate jewelry online? With NYC Bullion, it is very easy – all you have to do is fill up the “Get an offer now” form with all the necessary details and you will get your personal online appraisal by e-mail in no time. Or, if you prefer a face-to-face experience, you can stop by at our store in the Diamond District in Manhattan, and let our top-notch jewelry team authenticate your precious estate jewelry. Whether it’s a necklace, ring, or a pair of earrings, our certified staff will take you through the evaluation process step by step, so you will know for sure how much your old jewelry really costs. So don’t hesitate anymore – forget about local jewelry stores and undervalued prices – at NYC Bullion, you will get a fabulous cash payout for your estate jewelry and a smile for the best customer service in the jewelry industry! 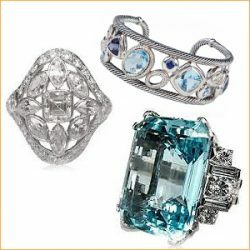 Many times, clients are confused on whether they own estate jewelry or antique jewelry. It’s time to clear things up. When referring to estate jewelry, we speak about pre-owned or so-called “used” jewelry that a person used to own. It can be your old pieces of jewelry or any jewelry that has been already worn by somebody. On the other side, when we talk about antique jewelry, we refer to jewelry items that are at least 70 years old, although, in official terms, antique jewelry is considered to have more than 100 years. It’s essential to keep in mind the difference between these two types of jewelry, so you don’t get confused about how your items have been graded. With NYCBullion, you can be sure that we accept for appraisal both estate and antique jewelry.